While I love serving home cooked meals to my family, I sometimes struggle to find the prep time during our busy, extra curricular packed evenings! When the schedule heats up and the weather cools down, I love to make soups and chili. I can make a huge batch that reheats well as leftovers for lunches or the next night's dinner. 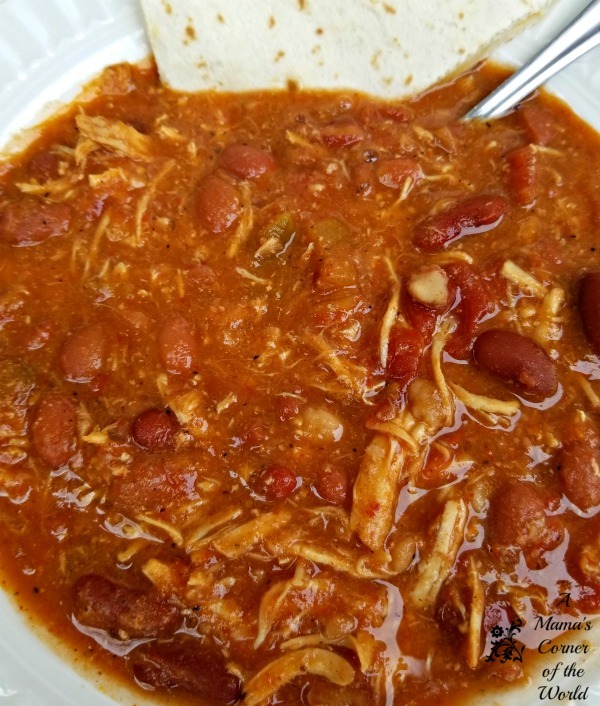 Make ahead recipes, like soups and stews, are usually fast to put together--and the cooking is a breeze when the recipe is slow cooker friendly, like this Chicken and Red Bean Chili recipe. 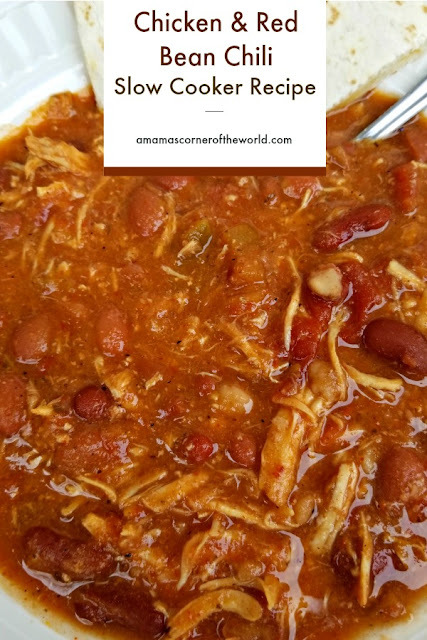 This recipe is similar to our Spicy Chicken and Black Bean Soup--but, it isn't quite as spicy and the whole family loves it. Load the Slow Cooker. Add the chicken, salsa, cumin chili powder, coriander, garlic powder, salt, pepper, tomatoes, kidney beans, red beans and vegetable stock to a large slow cooker. Rinse the inside of each can with about 1/3 can of water and pour the water into the slow cooker. This gets some of the starchy bean residue from the bottoms of the cans! Cover and cook on high for 4-5 hours or on low for 8 hours. Shred the Chicken. Pull the chicken pieces out from the pot, shred and return to the slow cooker--stirring the ingredients to distribute the chicken. Add the Refried Beans and Cook. Stir in the refried beans and mix it in well to remove clumps. Reduce the slow cooker heat to low, cover and continue to cook for about 20 minutes more. Serve. Ladle the Chicken & Red Bean Chili into soup bowls. Garnish the bowls of soup with shredded cheese, jalapeno slices and sour cream if desired. We like to serve with cheese quesadilla triangles and shredded Monterey jack cheese. Make ahead recipes, like soups and stews, are usually fast to put together--and the cooking is a breeze when the recipe is slow cooker friendly, like this Chicken and Red Bean Chili recipe.